It’s not often that we find a study for MS that might yield results that benefit the person with MS, our doctors and a major pharmaceutical company – and all for the small cost of around $100. Biogen Idec, the pharmaceutical company that makes Avonex, Tecfidera, Tysabri, Plegridy and many more MS drugs in the development pipeline, recently announced results of their study on ways to get us moving and how to track those results in a meaningful way. They had 250 people with MS fitted with Fitbits, a small electronic activity tracking device that can be worn on the wrist. The Fitbit is just one type of activity tracker that is popular with athletes in training and other people who want to monitor their daily moves. There are many other brands of these portable fitness tracking devices that work in similar ways – this study just happens to use the Fitbit. The Fitbit works somewhat like a pedometer, but with many more features. It does the basics of counting steps the wearer takes through the day, but it also keeps a 24 hour log of movement. It knows when the wearer is sleeping or awake, sitting or walking, and through using the computer program that comes with it, the wearer can also track other activities and food intake. It can be synced with a computer or a smartphone or tablet. For a person in training, this is a great tool to use for keeping personal records, but on the wrist of people with MS it becomes so much more, as shown by this study. The official results of this work will be published soon, but for now Biogen Idec is talking about the positive results and the possible value to people with MS and their clinicians. People who wear the Fitbit are more conscious of their activity level, merely by seeing what they have done each day. Having hard numbers on how many steps were taken helps to set a mental benchmark of how to do just a bit more each day. 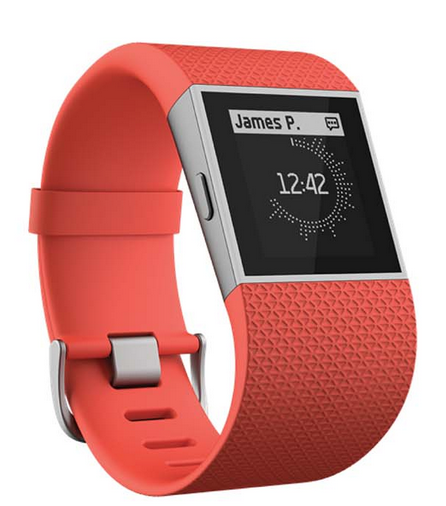 I know about this from first hand use of a Fitbit – I got mine in October 2013 and wore it 24/7 for at least 10 months. It’s a sturdy little device and I wore it in the pool, the shower, and while sleeping. I didn’t take advantage of the other features of the Fitbit, such as tracking calories, but I did use it as a reminder to get up and move. Unfortunately, I developed a stress fracture in my foot which seriously kept me from walking much and I eventually took off my Fitbit and set it aside. A co-worker who is always doing more to exercise, got her Fitbit last year and admits she became obsessed with the numbers and was always trying to get more …. My Fitbit goal was set at 5,000 steps per day but she started her goals at 10,000 steps and had quickly moved it up to over 25,000 steps per day before she stopped wearing it. That tiny little device challenged her to do more and more. For me, it was a way to keep track that I had moved enough. In the news about this Fitbit study by Biogen Idec, they talked to a patient who lost 17 pounds over the six week trial period, and she said the device made her want to do more. The value of the Fitbit data to our medical team could be significant – most of us only see our neurologists for 15-30 minutes at a time, a few times a year, and discuss how well and how much we are moving. The Fitbit can take our data from wearing it 24/7 and give the doctors a more complete view of our activity levels and how that might relate to our disease progression. Other questions the might be answerable through Fitbit data could include such things as does our walking change before a relapse and how does our mobility relate to how effective our drug treatment. Which brings me to the final point that is not quite so obvious from this study – we can’t overlook what Biogen Idec might gain from all of this; they are clearly the leader in the manufacture and distribution of MS disease modifying therapies, and control much of the market. But at a cost of $50,000 or more a year for the drug treatments, we can all assume there is going to be closer looks from insurance companies to see if they are getting a good return on their money. Express Scripts, one of the larger prescription providers in the US (and mine) has now taken Rebif off their list of covered MS Drugs – a decision that seems to be primarily guided by economics. Biogen Idec , as well as the other drug makers, need to prove their drugs work as well if not better than others to continue to satisfy the insurers. Getting Fitbits on the wrists of many of us using their drugs would possibly add strong patient data that supports the continued use of their drugs. That’s a wise investment for them for $100 – it would be to their advantage to offer them to all of their DMT users in the future if it helps maintain their market share.